Founded in 2011, Perkins Eastman DC taps a tradition of design dating back to 1959, as well as extensive experience in the District of Columbia. Our firm is a dynamic design practice with diverse expertise in the design of the community centers, government buildings, educational facilities, housing, and large scale mixed-use projects that make up our city. Individually, the Principals and staff of Perkins Eastman DC have been at the forefront of new developments in the field of education and community design for more than two decades in Washington, DC and abroad. With expertise in architecture, master planning, urban design, historic preservation, and adaptive reuse, we are able to assist communities on a comprehensive range of projects. The firm’s community design and educational experience has also been greatly enhanced by the wide variety of projects our staff has completed for colleges and universities, including campus master plans, site designs, classrooms, lecture halls, libraries, academic offices, performing arts and student activity centers, residence halls, research laboratories, and historic building restoration. 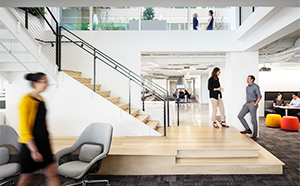 This comprehensive and future-oriented approach to community and educational design enables Perkins Eastman DC to create flexible, state-of-the-art community and learning environments.